...so what are we gonna do? What an upbeat title, huh? But as an atheist, lately I've been thinking about the fact that I absolutely do not want a Christian funeral, or any funeral, and I'd better get on the stick to see that that doesn't happen. I'm writing this article to help my fellow free-thinkers with information I've dug up on this subject. It's not too early to think about these things, after all, any one of us could be hit by a bus tomorrow ! I found that the majority of free-thinkers prefer to be cremated, and when you think about it, it makes sense. Putting yourself in the hands of a funeral home, whether you are religious or not, can cause a lot of unwanted things to happen. I have been responsible for the planning of 4 funerals at 4 different funeral homes, and I can tell you that the calm, smiling and seemingly 'concerned' funeral directors ( and sales staff ) have one goal in mind, to extract as much moo-la from your pockets at a very vulnerable time in your life. 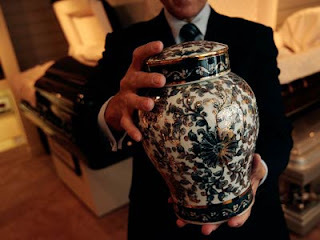 It is not necessary to go thru a funeral home in order to be cremated, and believe me, funeral homes jack up the price and also add extra fees. My state ( Mich. ) has a " Cremation Society of Michigan ", and you become a member ( $40.00 for individuals, and $70.00 for married couples ) and are openly welcome to inspect the crematory yourself at any time. Your loved ones are even allowed to be there for the entire cremation process after you die, if they choose to do so. All costs, including them to come and "fetch" you, are included in the $1,295.00 total. In some states it's even cheaper....and one hell of a lot cheaper than the $7,500.00 national average cost of a traditional funeral. They also partner with Hospice to provide grief assistance to families at no additional cost. If cremation isn't your cup of tea, there is what is called green burial, or natural burial. Not all states have green cemeteries yet though. There is no embalming, and the person is placed in an eco-friendly "casket" (inexpensive) or wrapped in a shroud type cloth, or a favorite blanket. If this is of interest to you, click on www.naturalburial.coop. This is The Centre for Natural Burial. I also checked into "backyard burials", and was surprised at the number of states that allowed it. Each state is different, but if you call your state's Department of Health ( or Department of Public Health ) and ask for the "Mortuary Standards Supervisor" ( perhaps that title is a little different in different states ) you can find out the regulations for burial on your property, or your children's property. Also there is a website that is interesting for backyard burials called "Backyard burial...yes, you can"
the website is www.backyardburial.net. Then click on "Legal"
Ten years ago, our young neighbor died very unexpectedly, and his Dad, who lived in Kentucky on hundreds of acres, buried him there on his property. I always thought that that was pretty cool. Heck, when wagon trains headed West, they say that there were at least a thousand or more men, women & children who were buried right next to the trail-----no rules and regulations then. Now, in the funeral industry, there's enough rules to choke a horse. I've given a lot of thought as to what I want to happen after I die. I have to write it all out, make a lot of copies ( extra ones so my kids could send them to uptight fundy relatives if they start to snort that I MUST have a christian burial ! ) and sit down with my Daughters to have a heart to heart about my wishes....and tell them if they don't abide, I'll haunt them for the rest of their days. I am by-passing the funeral home all together. The other half, is to be scattered in a beautiful valley called Moose Meadow ( goofy name though )by my kids, sons-in-law & grandkids. This is in Banff National Park in the Canadian Rockies, the prettiest and most serene place I've ever seen. I've set aside a fund, just so that it will pay for all of them to fly out there ( with me in a Mason Jar I suppose! ) plus stay on afterwards to enjoy the beauty and solitude of that area. I'm going to tell the kids that they CAN say prayers and sing religious songs at both places....of course this is entirely for THEIR benefit and comfort...I wouldn't take that away from them. "Spare me the whispering, crowded room, the friends who come and gape and go, the ceremonious air of gloom....all, which makes death a hideous show"
Now-a-days there are so many alternatives to a traditional funeral. Last week I heard about a free-spirited atheist who had his ashes flung out from a cliff in one of those beautiful Western Parks with the unusual rock formations. All the people who attended rode horses there and as the ashes were flung out, they sang "Happy Trails To You"
I'm curious if anyone reading this, has thoughts about what their last wishes are, ANYTHING FUNNY OR UNUSUAL ? ? Hannu wants everything to be perfect for his anniversary trip to the hotel where he and his wife honeymooned 30 years earlier. So he gets there a day early to make all the arrangements. That night, he e-mails her but misspells the address and it goes to a recent widow. "My darling wife, I've just gotten here and everything's set for your arrival tomorrow. I hope your trip down here will be as pleasant as mine."